Perhaps the wait will be over a year from now. The Merrimack High hockey team has not been to a state championship game since 2013. Perhaps next year things might change. Why? That simple age-old graduation formula: Merrimack loses just one senior. Watch out for the Tomahawks. 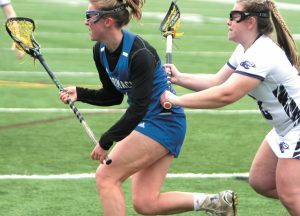 They won a quarterfinal tourney game on the road, shutting out Goffstown, and they chalk their 8-1 semifinal loss to Dover to inexperience – and call it valuable experience. Remember, their two All-Staters, forward Zach Stimeling and goalie Ben Hardy (both Second Teamers) are likely back along with everyone else except reliable graduating senior Noah Melker. And two players who missed the tourney, second line center Zach Richard, and first line left winger Dom Caroza, will be back. And head coach Dan Belliveau can see a familiar pattern. Food for thought. Meanwhile, it was a hugely successful first year for the new Alvirne-Milford co-op, which won eight games and made the post season (losing in the play-in game in a tight 4-2 game with Oyster River).